Women! 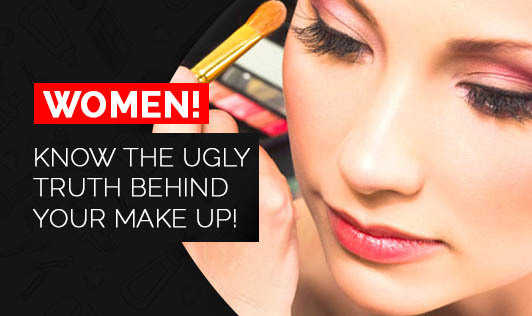 Know the Ugly truth behind your make up! • Make sure you remove your eye makeup before sleeping as you might wake up with itchy, blood shot eyes or even an eye infection. • A sheer high gloss lipstick can attract damaging UV rays. Use an opaque lipstick and top it up with a lip balm of at least SPF 30 to protect your lips. • Nail polish, particularly dark colors may stain your nails and leave them yellow colored or discolored. Prefer light colors or transparent gloss. • According to FDA, there is no ‘Hypoallergenic cosmetics'. Products that claim so can still trigger allergic reactions. Be aware! • Keep eye infections at bay by changing your eye makeup products every 3 months once; especially mascara. • Sharing makeup with friends, exposing makeup to heat or light or using makeup when you have an eye infection can promote bacterial growth in makeup. • Some lipsticks and eye makeup products made in the U.S contain lead. However, the quantities you swallow only very small quantities of it. • The most common cosmetic-related injury is scratching the eye with a mascara wand leading to eye infections, ulcers on the cornea, eye lash loss, or even blindness! • A product can either be classified as a drug or a cosmetic based on the intended use. If a company claims that the cosmetic has medicinal benefits, they may be breaking the law. • Good news to all you women out there! There is no hard evidence linking the use of cosmetics with cancer though certain products require thorough testing.